NASA’s Armstrong Flight Research Center is interested in exploring the skies of Mars, but the idea is easier than the actual execution. 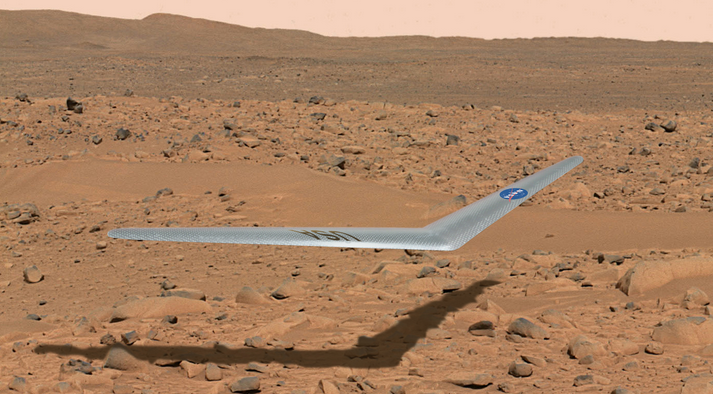 Currently, NASA is developing a prototype of a flying wing aircraft called Prandtl-m, with the potential to be the first man-made vehicle ever to fly on Mars. The Prandtl-m, which resembles a giant boomerang, will have a wingspan of 2 feet when deployed and be made of fiberglass or carbon fiber. The most important part of building the flying prototype is keeping in mind the fact that it must be lightweight in order to fly efficiently on Mars, which has much less gravity than Earth. At the moment, the Prandtl-m weighs just under 1 pound but it reportedly can weigh up to 2.6 pounds and still fly in the Martian skies. Also, as a result of the Martian atmosphere being much thinner than Earth’s the Prandtl-m will be undergoing high altitude tests, with a 100,000-foot and 450,000-foot test planned by NASA. Eventually, if all goes well, a folded-up Prandtl-m will be packed inside a spacecraft heading to Mars, where it is supposed to deploy and glide for 20 miles through the Martian atmosphere before landing.